Instructions: Cut white card stock 10" x 7"and fold in half to create a 5" x 7" card base. Cut blue design paper 4 7/8" x 6 7/8", add to card front. Cut print design paper 4 3/4" x 6 3/4", add to card. Cut 2 pieces of lace 5 3/4", add to top and bottom of card. Use Eyelet Oval Die with blue design paper, do not cut out center. Stamp Hand-Stitched Background on white card stock with Bamboo Leaves, die cut with center from Eyelet Oval Die, add to blue piece. 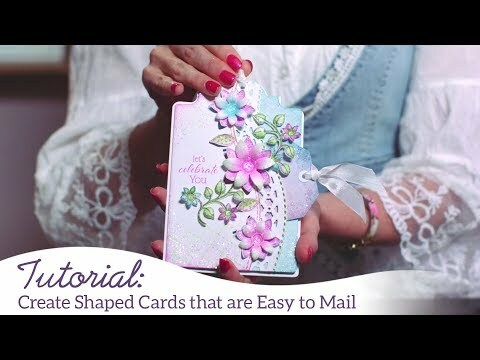 Add to card with foam tape. Die cut sentiment from blue design paper with Ornamental Tags Die. Die cut the background from white card stock, adhere the 2 pieces together. 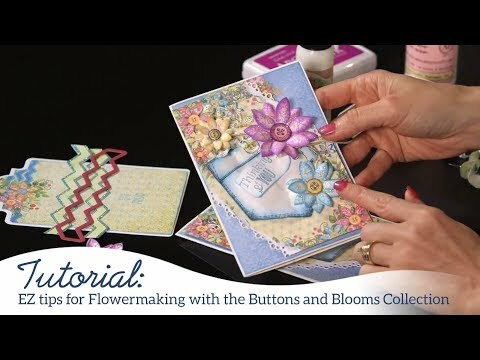 Stamp the Buttons and Blooms flowers with Magenta Hue, die cut with coordinating die, Sponge edges with same ink with daubers, layer and add a flat backed pearl. Stamp 2 sets of the flower spray from the Patchwork Daisy Border set on white card stock, once with Bamboo Leaves and once with Aquamarine. Die cut with coordinating die. Sponge edges with same inks. Add the green flower spray to the card. Cut the flowers from the blue spray and add to the green spray. Add Nuvo Drops to the centers. Add the pink flowers. Add the sentiment and bow. Add Stickles to flowers and lace.